This pacey novella is a perfect weekend read. 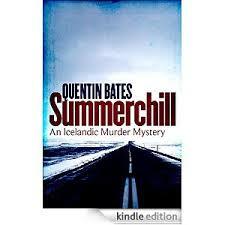 Published this month, it continues Quentin Bates’ popular Icelandic detective series and, at 142 pages, is a perfect stop-gap to tide you over until his next novel comes out. The story focuses on Logi, a carpenter (amongst other things!) who finds himself doing a job for some people who turn out to be rather dodgy. As one incident leads to another Logi finds himself getting deeper into trouble and is soon forced to take some dramatic actions of his own. As their investigation for the missing man encounters dead ends and non co-operative witnesses Gunna and Helgi have to draw on all of their resources to piece together what has happened. The story thunders along as both criminals and police race to locate their target before its too late. Although the story follows Gunna and Helgi’s investigation, it’s more about the criminal underworld lurking beneath the surface of Reykjavík. It immerses the reader into the world Logi becomes drawn into, highlighting some of the illegal practices and the ways in which criminal gangs extort money from the vulnerable and unsuspecting. Recommended for fans of Icelandic noir and police procedurals.